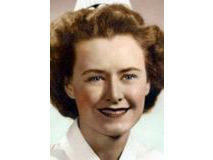 Betty Pease of Brewster, died Dec. 16. She was 83. Outspoken and plain speaking, Betty Pease is featured in this month's A Life Remembered. The Old Rugged Cross by George Bernard was one of Betty Pease's favorite songs, and she instructed her husband of 60 years, Frank Pease, to make sure the song was played at her memorial. And he did -- reluctantly. "That was one of her favorites," Frank Pease said. "At her mothers' funeral they had it. At her grandmothers' funeral they had it. But I don't care for it. It's a tear jerker!" Frank mentioned his feelings for the song when discussing Betty's memorial service with their Pastor, Doug Scalise of the Brewster Baptist Church. "I said, 'Look, Betty made me promise for years, that we'd sing this at her funeral.' I said, 'Doug, I don't like it.' He said, 'You know, Betty isn't here, you don't have to do it.' And I said, 'if I meet up with her again, she'll kill me!' So he said, 'Let's do two verses.' So we got away with that. Haha." In life, Betty Pease was compassionate. She loved conversation and people. But she also was a woman with strong convictions who knew what she wanted, and what she thought was right. "Betty was the kind of person who always had an opinion about something, and she was happy to let you know what it was," Scalise said. "And so whether that involved something that was happening in church or in town or in the country, she would tell you in no uncertain terms what she thought of it. And most people don't do that." She can be described in many ways, but Roslyn Garfield was a small town attorney, in one of the smallest of towns. To her credit, she was more interested in helping struggling artists and entangled whales than she was in taking big, pay-day cases from Boston-based developers. 89-year-old Gloria Sargent Smith of Yarmouthport, died at sunrise on October 5, surrounded by half-read books, works of art, family members and pets.